Getting about at the leisurely time of 0700, a good nights sleep had been enjoyed. Breakfast was luxury, cooking bacon and eggs in the room. I have not had bacon for 5 months. In a bread roll with copious amounts of pepper and Tobasco. It was for me indulgence. Other people were wandering past the room obviously having a good whiff. Heading into town, they were holding a huge Sunday market, every manner of food was available, as were every fruit and vege wanted. 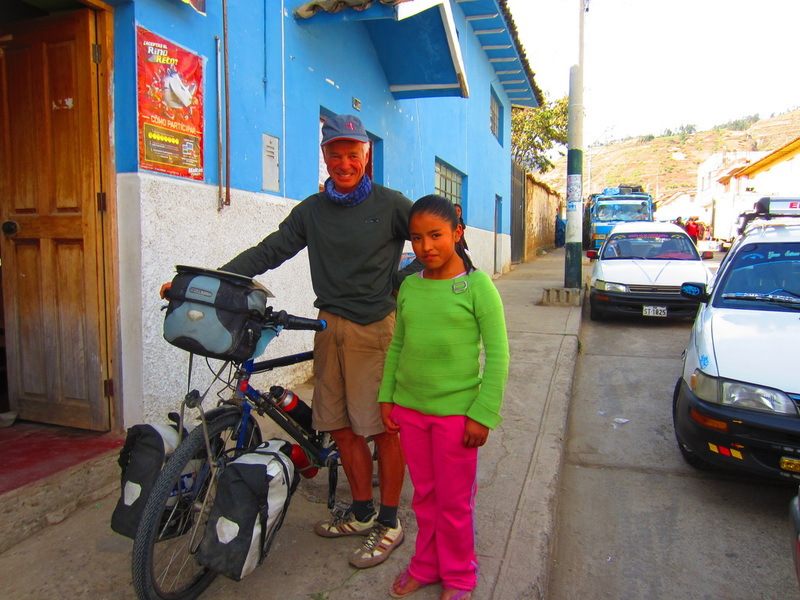 The bike was slowly loaded with everything from bread to lemons and avocados. People were so friendly, it was a fun experience. Soon the smell of chicharrone was sensed. A nice piece was chosen , this stuff is so good. 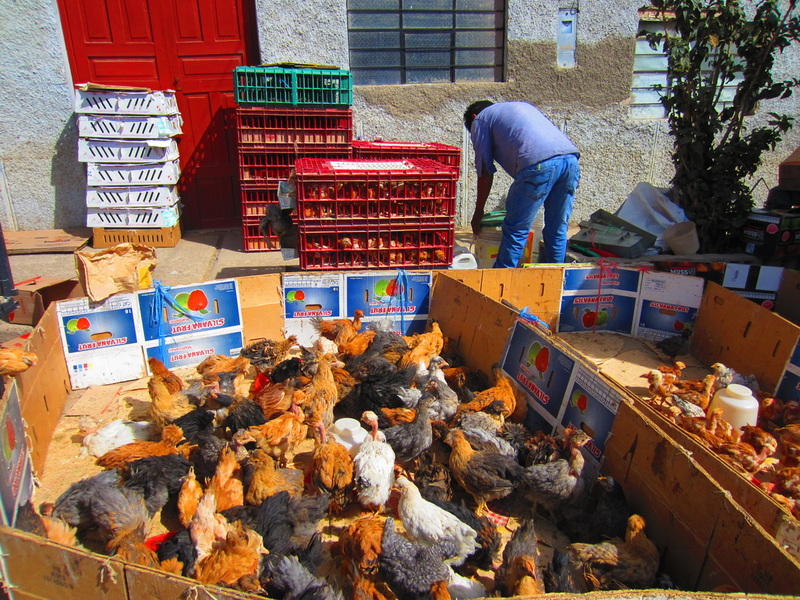 By now it was nearly 1000, further into the markets chickens were being sold for 8 soles each. They were 15 days old. I finally got out of the markets and let gravity propel me away. Soon another stall was found, where passionfruit were bought and eaten on site. Leaving here, a group of touring cyclists could be seen in the distance, we waved. I pulled over to their side of the road. They were a French family with 3 young children, 2 had loaded bikes, whilst the 3rd was in a trailer being pulled by the dad. 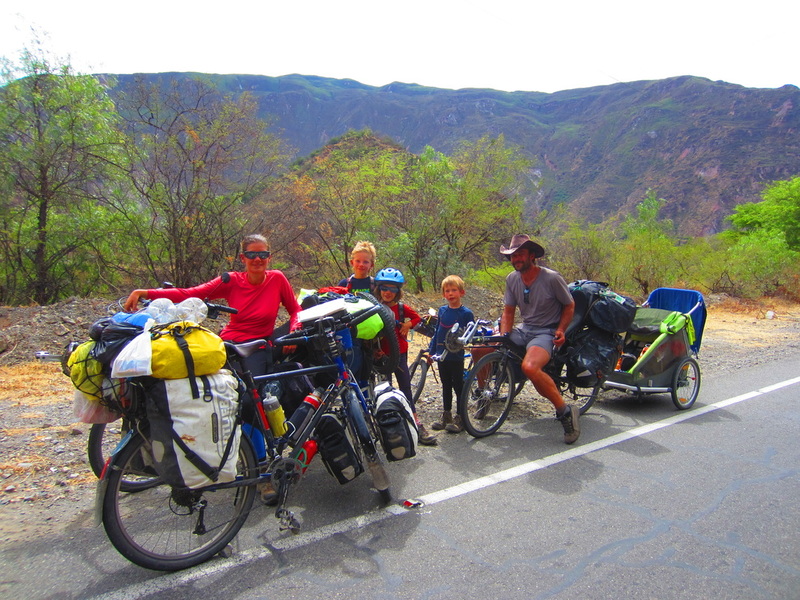 The parents were riding recumbents. We stopped and talked for an hour. The wife spoke some English and knew some Spanish, the husband only spoke Fench like the children. They were a lovely family. What a holiday, from Santiago to Lima. The dad told me with his youngest in the trailer he had 80kg of equipment. 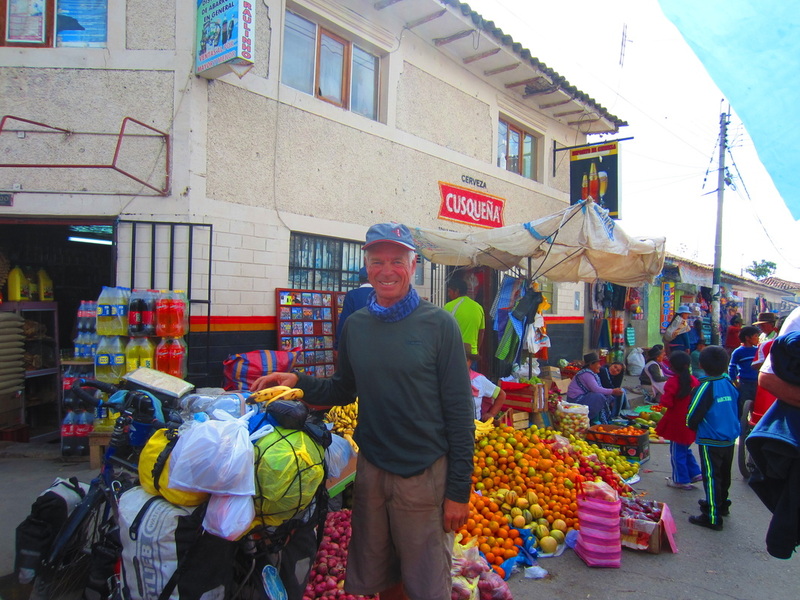 We swapped cards, they gave me some good tips for Bolivia. 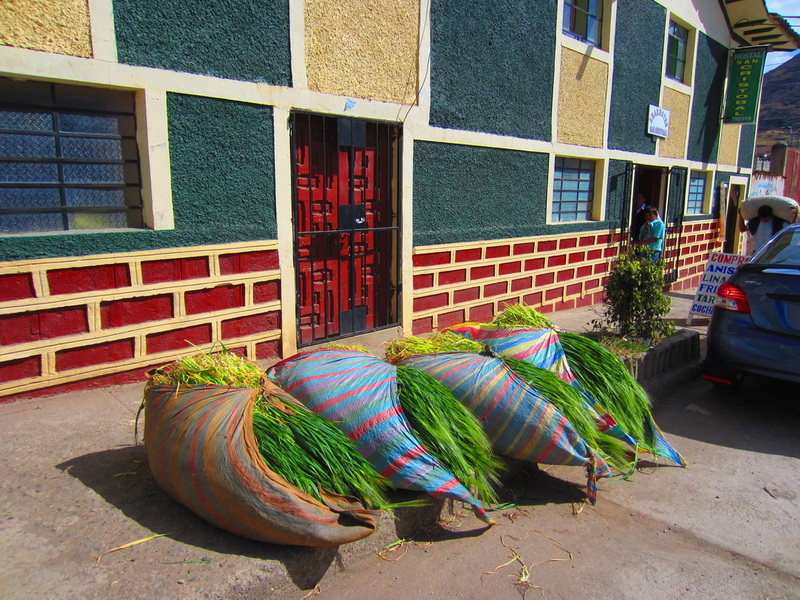 I told them about bencina to use in their stove, they had been using gasoline. We all agreed it was great to see other cyclists, they had seen very few in their travels. Well the day was almost done for any big distances. Next stop at 1230, saw me get the 2 water bottles filled for a camp somewhere. Nearing the bottom of the descent and crossing a bridge. 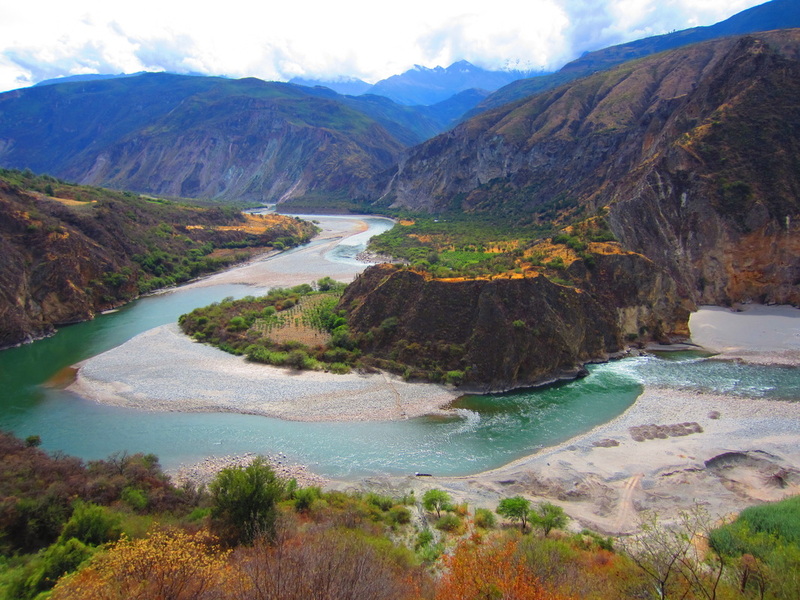 A sand quarry on the river bed was spotted. There was a track down to it, There was equipment parked below. The gate was open, so taking the punt I rode down, it was a wild track. At the equipment parking area I was greeted by a couple of seriously vicious dogs. I applied, the no fear, no eye contact rule. A group of guys came over. We introduced ourselves. I asked could if I camp here. 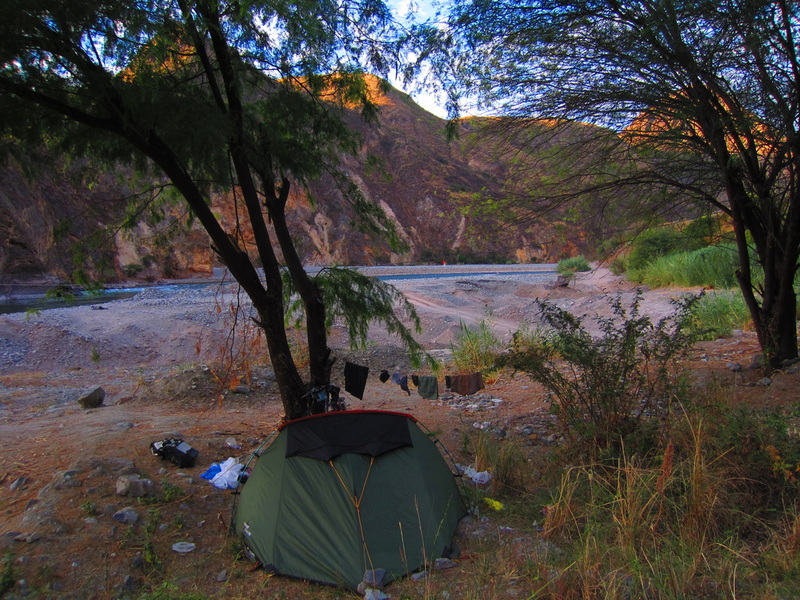 I told them I hadn’t swum in a Peruano river yet and this was a perfect spot. They were happy to have me here. I explaining I was self contained and would leave early. I am not looking forward to getting back up to the highway tomorrow. It will be a walk. Once I found a sight, The small sandflies overcame me they were in their thousands and relentless. I was bitten to bits. So much for the idyllic afternoon reading and basking in the warmth. I had to gress up like moth in a cacoon. Working out it wasn’t sunburnt ears but these things biting inside them. Luckily I had kept some Deet from the Mississippi trip. It saved the afternoon. A swim was briefly enjoyed, the water was heart attack cold. Dressed only in my keens, it was indeed a hurried affair. At least for the five minutes it was respite from the sandflies. My rear tyre had been holed by a spined, that was repaired and both rims were cleaned at the waters edge. The black soot from the brake pads gets on everything when changing a tyre. A bit of fishing was also done with a lure, no luck was had, bait seems to be the best here of nets!! As soon as the sun went down, the flies disappeared with it. So good, though in their place were a multitude of flying insect species, all attract to my computer screen, so much for blogging. Putting all this aside it was pleasant down here in the warmth, the Apurimac, a large powerful river could be heard in the background. The guys at the quarry told me to be careful swimming the whirlpools can drag you under. Me, my concerns were those of having a huge upstream walk if caught in the current. In bed about 0830, a noise was heard outside, my senses as usual went into overdrive. Without leaving the tent a get out of here call was delivered. Soon I got up and spotted about. It was a pig, interestingly their eyes don’t shine in the light, maybe he had them closed! The rest of the night was sent into oblivion with the onslaught of sleep. Fully loaded with fresh food. There is water for the taking everywhere. 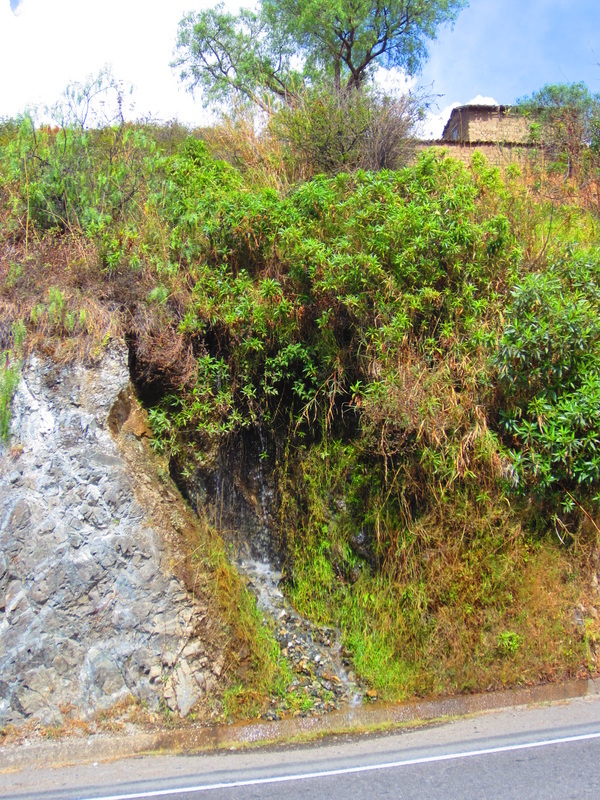 It is channelled past almost every house in the rural areas, no houses no water or the altitude is beyond agriculture.